Let me know what you think of my spring experiment. traditional evaluation: I have to add that I am not an expert on the traditial side. I am sure others, like Andy will have to say more and more that makes sense. Anyway, the repetition of a flowering tree and a picture of flowering trees is a no no. If these are flowering trees, at least they look like this to me. The tree looks at the picutre, which is fine. The viewer looks at the tree and at the picture and back at the tree and then diecides that the picture has a bit greater optical weight. They challenge each other. The picture almost seems to be that main thing here. No no! Just out of my belly: I try to shut off my intellect and let my stomach speak. From a radical point of view: Great that another one does it his way and does not try to repeat what others have done. Great that some rules are broken here, not out of ignortance, but because it seemed to fit. 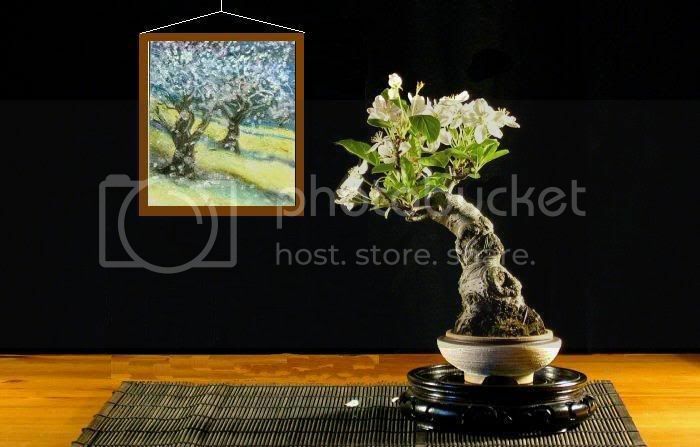 From a political point of view: For many people who do not think that bonsai is art it becomes art if it is combined with what people conceive as 'real' art. In this example a painting. So for many people this setting would appear as art, while they would not consider the single tree as art. Does that matter, is this good? Well, yes and no. It does not matter what the majority of people think as long as a few think the 'right' way. On the other hand, how are we ever going to get bonsai out of garden centers, botanical gardens etc. into art galleries if not by this trick among others. Or does it matter whether we ever will? First of all, it's great to see the Members' Gallery being used for what it was intended - artistic photographs of trees carefully presented. Thank you. That you are pushing the boundaries here is an additional bonus! I really like the interface between tree and pot. This is decidedly non-traditional, but for me it really works. (Kevin has done an excellent job with this pot, by the way.) The inner rim allows the pot to simply cap off the base of the tree tightly, an effect you've used with great success - and yet the flat outer rim (aided by the feet) confers the necessary visual stability without which the composition would resemble the old child's toy "Weeble-wobble". and seem out of place on that relatively ornate stand which too closely echoes the gross form of the pot itself while failing to reflect its fine-scale structure and texture. The two petals are a nice touch, much more casual in appearance than the "rose-petal bed" effect that you were playing with a year ago. These form a very subtle third point to the three-point display. And now the painting. I wish I could rave about it, but it's not a perfect fit...yet. Here are the problems that I see; tell me where I'm missing the boat. As Walter mentions, the duplicated subject would usually be seen as a problem. I appreciate your willingness to challenge this - but I'm not sure you're entirely successful. If one element were more clearly subjugated to a "background" role and the other more clearly in the foreground, this might work better. I could envision the painting of the trees acting more as the smaller "perspective trees" in the back or at the sides of a forest planting. How? Through some combination of position, scale, color saturation, etc. Obviously, position is your sole recourse now that the painting is complete. In the painting, the slope of the hill and the movement of the trees slants away from your subject tree. I'd prefer to see them relating to one other with their visual flow. Finally, I'm personally troubled by the way that the painting breaks the vertical plane, resting at an angle with its base forward. For me it creates an unconfortable uncertainty --- is this painting acting as a two-dimensional window or a three-dimensional sculpture? Despite all of those concerns, which are easy to hammer out on the keyboard, I like the composition. (And the photography is beautiful, by the way.) For me, it's evocative, and that ultimately is the point of the endeavor. I look forward to hearing your comments and seeing your future efforts. Here are my virtual suggestions for possible improvement. In my opinion the painting (oil pastel?) is too large for the current display. Shrinking it down a bit and hanging it makes it much less obtrusive. I also took Carl's suggestion and flipped it so that the hills flow in the other direciton. To be brief, I loved your initial presentation except for the picture which looks like an afterthought (no disrespect intended). There was no "spacial" quality. Then Charles and Walter added the picture as a "wallhanger" and a depth was immediately added. I think the position AND the reduction in size added to this quality. After looking at both, the second (I believe Walter's) is a much better scale (than the original) and with the reduction in size, the colors are in compliment with one another and the picture no longer overpowers. I find that setup very appealing. This is really great for Monday morning musings. It instantly gave a great start to this week. Thank you for that. Without repeating what the other guys said (all of that make a lot of sense to me), I like Charles' set up the best. It places the two artworks on equal footings and adds the much required space to your initial presentation. I feel that emply spaces and the sense of depth are crucial to these presentations. On your display the painting and tree were too close, intruding into each-other's "personal space" (I would have a hard time defining what that space is, but to me each element seems to have one). In addition the painting drew more of my attention than the tree, which bothered me a bit. I also agree with Carl that a different stand would fit better, I see too many concentric circles (about 8 of them) between the stand and the pot. Walter's display puts the tree definitely into the center of attention, but I like the one by Charles better, where I see a "conversation" going between the tree in the pot and the trees in the painting. In the end, the arrangement evokes the colours and freshness of a spring time orchard very vividly to me, and that's what matters. Thank you sincerely everyone for your valuable comments and also the very useful virtual improvements made. I shall make sure to try to incorporate some of them into my summer experiment! One thing is clear ? (and was as soon as I looked at the photo, as opposed to seeing the composition in situ), that the picture as it stands is too overpowering for the tree. My eye is constantly flicking from one to the next, never knowing where to focus. So for me, both Walter and Charles, (and Attila and Carl), are completely correct in their critiques concerning the visual balance between the two pieces. I?m not going to make excuses, but the use of the picture was far from afterthought ? although, if it appears that way, then the composition is not entirely successful as it stands. Within the usual two point display, we accept that the companion and the main piece should point, or reach, to one another. My experiment wanted to explore that premise, and use the picture as a window to the rest of the world, with the tree being part of the same landscape, leaning in the same direction as the picture, echoing the visual flow. Leads the eye out of the scene. Failure! Flowering tree, with flowering trees? This is another break from what is accepted, and I wanted to explore this. From Walter?s and Charles? interpretations of the experiment, I am not so sure that this convention can be so hard and fast if we are breaking away from traditional display. (Yeah, I know some of you will ask why I am bothering). Okay, this is nothing new really. My intention was to explore the use of a picture to display as the second element, but to learn a few pointers from the Japanese tradition, namely, that the picture should be quite simple and lend compliment the scene, rather than compete with it, and that a frame would probably be a mistake for the same reasons. More experiments required! [You?ll all be pleased to hear]. The stand and pot were not specifically part of my little experiment, but the thoughts that others have expressed are equally useful nevertheless. I've arrived a little late, but I'm going to throw my hat into the ring. The perspective added by Walter's virtual view made more sense to me than any of the others. I think that part of the reason for that is the fact that I see the real tree as representing Spring but the picture seems to me, at least, to be representative of Winter. The juxtapositioning of those two conflicted, for me.